What’s your motivation to do good? 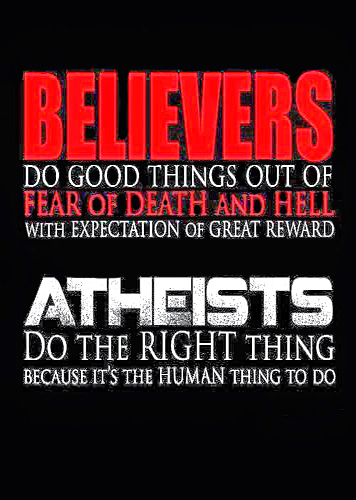 I wondered about that after seeing this graphic on an Internet atheism community. Is it true that people who follow Jesus Christ — whom serious Christians consider to be God’s Son — do good only because of fear and a desire of eternal reward in Heaven? Keep open house; be generous with your lives. By opening up to others, you’ll prompt people to open up with God (that’s from a section of the Bible called ‘Matthew’). Whenever you saw a brother or sister hungry or cold, whatever you did to the least of these, so you did to Me (also from ‘Matthew’). Be generous. Give to the poor (from ‘Luke’, one of four accounts of Jesus’ life). It’s statements like these, and many more in the Bible, that inspire millions of Jesus followers to fuel the work of Christian organizations like Samaritan’s Purse, Compassion Canada, World Vision, Food For The Hungry, International Justice Mission, World Relief Canada and many more. Most Christians keep in mind this key Bible statement, found in a section called ‘John’: This is how much God loved the world: He gave his Son, his one and only Son. And this is why: so that no one need be destroyed; by believing in Jesus, anyone can have a whole and lasting life. Since God loves the world (and that means EVERYONE in it), then those who follow God’s Son should have the same attitude. In Nazi Germany, the right thing to do was imprison, torture and exterminate millions of Jews, gypsies, Slavic people, serious Christians and many other groups. In 1994 Rwanda, the right thing to do, for thousands of Hutu people, was slaughter members of the Tutsi tribe. As many as a million died before the massacre ended. During the 1970s in Cambodia, the right thing to do, for many thousands of members of the Pol Pot regime, was execute, starve and torture more than a million people. When I consider all this, it makes sense to decide what is good or right by following the one person who always had (and has) it figured out: Jesus Christ. By following in Jesus and trusting in what He accomplished through His life, death and resurrection, you’ll find yourself doing good things. Why? Because when you believe in Jesus, your life will be, in a word, transformed. Now and for all eternity. The problem that I see with saying Jesus had it altogether is not the good things he managed to say but the weird things he did and the things he did not say. The good things he said were said by others and much of it common knowledge since humans have an innate sense of right and wrong due to being a social species. He did not condemn slavery. He did not promote gender equality. He was YHWH incarnate yet failed to promote messages which would become common human decency in later years. He did not like the established religions yet Pauline Christians continue to create and support just that. In fact, he failed to be a leader or example for anything or any society beyond the start of modern science. He cursed a tree for having no fruit out of season. Cast demons out of people into pigs to let them die. He did not condemn belief in witches and demons. He did not condemn actions taken in the name of himself prior to his earthly incarnation. Jesus, it turns out, is much like any politician trying to get elected. He asks us to ignore the brutality of his past, his failure to right wrongs, and his complete failure to be forward looking. He wants us to look only at a few good things he did or said and demands that we believe in him without evidence. Following the christ on the basis of the Christian bible is much like deciding that Whinny the Poo is a good book to base your life on because he says a few good things. Cherry picking your way to heaven makes a mockery of the entire subject. 1. Just because the Bible doesn’t record it doesn’t mean Jesus didn’t say it. And whether others also said the same thing doesn’t affect the point I made. 2. Again, just because the Bible didn’t record Jesus condemning what 21st century people consider to be slavery doesn’t mean he didn’t. And Jesus went out of his way to treat women much better than the culture of the time; there are examples of that in the four accounts of his life (I’m not going to make this response any longer by listing them all). 3. “He failed to be a leader or example for anything or any society” — that’s your *opinion* (which appears to be based on an atheist bias) and you’re certainly welcome to it. 4. “Jesus, it turns out, is much like any politician trying to get elected” Another example of one person’s *opinion*. Jesus never tried to get rich or take advantage of anyone or twist things to his advantage. He didn’t try to make money on the side or cut deals with special interest groups. 5. “His complete failure to be forward looking.” How much forward-looking would satisfy people who either don’t believe he ever existed, or that he was just “like any politician trying to get elected”? The answer, as far as I’m concerned, is no amount would be satisfactory. Jesus predicted Jerusalem would be destroyed by the Romans (it was). He predicted his life and ministry would divide people (it did, it does and it always will). He predicted the Good News that he brought would fall on many deaf ears (it did, it does and it always will). When you accept as truth was wasn’t said it’s no different than believing a lie for the most part. Just because it wasn’t said doesn’t mean it’s not true… hmmmm He also did not say evolution is true. He didn’t say don’t mess with nuclear energy. He didn’t say honor your children. He didn’t say women should be equal to men. He didn’t say that skin color does not matter. He is seen to have done good works but he could have done a lot more if he had mentioned ‘wash your hands’ or boil the water or keep the rats out of your house or eat potatoes – they’re good for you, or a million other things that would have helped the very humanity he claims to want to save… from himself. He didn’t predict human flight, tactical nukes, ebola and others, gay rights, civil rights and a lot of other things that would have helped. It’s almost as if he wasn’t trying to help anyone but those who physically knew him or lived in his time. He didn’t even leave any writings, leaving that task to humans. He was supposedly YHWH in the flesh, all knowing, all powerful and all that he left behind is not enough to even verify that he was here. That he supposedly said some good things does not make him a deity nor prove that one has ever existed. It doesn’t even indicate that his version of the good thing said is the best one or the most useful. So what if Jesus didn’t predict the things you mentioned. If he did, would anyone have listened to him, beyond the apostles? Not a chance. As far as I can tell, your other points are opinions coming from an atheist mindset. I’m puzzled as to why any atheist would visit this website, since the ‘welcome’ page states this: “Please note that while everyone is welcome to visit and enjoy Frank’s Cottage, the material here is intended for those who are open to spirituality”. If I have any understanding of atheism, it’s that the members of that community want nothing to do with spirituality. Am I just missing something? Really, Frank? An entire religion arose out of the things he supposed did say, so what wonderful things do you honestly believe could have happened if he simply made mention of the things suggested by the other commenter? How much better would humanity have been able to cope if he had discussed something as simple as the reason for washing one’s hands after going to the toilet for example? If he was able to make a point about loving one’s neighbour and looking after widows and the poor, something like washing one’s hands should have been a doddle for God. I have no idea why Jesus didn’t talk about the things you refer to. But I’ll trust his judgement; it’s certainly better than yours or mine. I know this because, as a serious Christian, I believe Jesus is the Divine son of God. I’m puzzled, however, about why you and other atheists interact with this website. As the “welcome” page states, while everyone is welcome to visit and enjoy Frank’s Cottage, the material here is intended for those who are open to spirituality. Since the very definition of atheism excludes spirituality, this material should clearly be irrelevant. So why are you here? Am I missing something? Yes, Frank, but belief is not knowing. It is simply a belief. So how do you know? Thanks for your comment. I know by a mix of evidence and faith. That may be unsatisfactory to some people, but that’s not my problem. I see my question about why you are on this website is still unanswered. Why? faith I can understand, but what evidence are you referring to? I have explained why before. It is an open forum, I am interested in religion, you write, I read ,I comment. And as you address the majority of your posts to atheism I am even more interested, especially in correcting any erroneous picture you may paint. Which you frequently do, unfortunately. Surely you are not afraid of my questions? For evidence of Christianity, please refer to other blogs on Frank’s Cottage and on many, many other websites that go into detail about the evidence you claim to seek. As I’ve written before, I have no interest in “religion”. I have an interest in faith — specifically, faith in Jesus Christ. Some people might not see a difference between faith and “religion”, but I most certainly do and there are several Frank’s Cottage blogs that go into detail about those differences. Your lack of interest in Religion is commendable, yet you surely must acknowledge it was the Catholic Church at the instigation of Constantine that compiled the Bible you derive every scrap of information pertaining to the character Jesus of Nazareth? That this collection of ancient documents suffers from everything from obvious scientific inaccuracy to outright blatant fraud, an assertion backed by every genuine biblical scholar on the planet and even the Catholic Church itself should surely be a cause for grave concern on the part of the believer. There is plenty of evidence for Christianity, this I fully acknowledge, but the foundational tenets of this religion: the Virgin Birth for one, are based on false premise. The Nicene Creed is entirely man made. Surely you are fully aware of the history of Christianity? I am only interested in revealing the truth. What you believe as an adult is your affair. That this stuff is indoctrinated into children whose brains have not fully developed, with threats of Hell and eternal torture, of a god that is supposed to be loving yet enacts and demands brutal murder is, as far as I am concerned, despicable, and illustrates the fragility of any belief system. No-one has the right to torture children in this fashion. No one. And for this reason I call out any who promote religion – whether they call it faith or some other semantic turn of phrase. You continually ask why an atheist would comment on such a site as yours? My question to you is: why do feel the need to promote your belief on an open forum? Thanks for your comment. I’m fully aware of the history of Christianity. Are you fully aware of the history of atheism? I don’t care if the virgin birth is real or not. It has no effect on my faith in Jesus Christ. No one has the right to torture children (whose brains have not fully developed) by indoctrinating them with the dogma of the atheist faith – that they have no souls and when they die, ALL that they are will become nothing more than rancid worm food. No one. I don’t “feel the need” to promote Christianity. I feel the need to obey the Son of God, who tells his followers to “go to the people of all nations and make them my disciples. Baptize them in the name of the Father, the Son, and the Holy Spirit” (from a section of the Bible called ‘Matthew’). And I believe following Jesus is the best thing any human being can ever hope to do. Atheism is the default position of humanity, Frank. There is no ”history” in the sense you imply. Does it not? This is one of the major tenets of Christianity. If you do not believe it then could you explain how you understand the divine nature of the character Jesus of Nazareth and how he came by this divinity? I agree wholeheartedly. Any form of indoctrination is abhorrent. Children should be presented with truth and evidence based fact. Atheism is not a ‘faith’ by the way, Frank, simply a non-belief on gods. There are plenty of sites where this definition is explained fully for those , like you apparently,who are still struggling to understand the correct definition. Matters of faith should be made as an adult, based on critical thought and careful evaluation of the evidence. You have made your choice, and would not take kindly to a Catholic for example, telling you that yooui muxt become a Catholic or you will perish in the Fires of Hell. So, don’t you think you should afford the same respect to children? Surely not to do this is the height of hypocrisy? You seem to have an unhealthy predilection with ”worm food”, Frank? You have no verifiable evidence that the character, Jesus of Nazareth said anything. Your only source is the anonymous gospels, which we ( you too ) know only too well are not the original documents, are not eye- witness accounts and have suffered from numerous problems from rewriting, including blatant interpolation. So, as you reject religion, including the religion that was responsible for the compilation of the bible,which I would suggest would be a fair bet you consider is corrupt, exactly how do you know you are obeying the Son of God, and not the corrupt text from a corrupt church? Children should be presented with MORE than just “truth and evidence-based fact”. Those are just cover words for atheism. And that is, as you put it, “the height of hypocrisy”. Atheism is NOT the “default position of humanity”. That’s simply clever, manipulative atheist propaganda. You are quite wrong about my thoughts on conversing with a Catholic. I would take very kindly to ANY kind of faith conversation with a Catholic. Or any other person who is interested in spirituality. I have a healthy predilection for telling the truth about atheism. If some people don’t care for that, so be it. If an atheist person wants to call the Bible corrupt and a church corrupt, that’s their business. There are all kinds of websites and books out there that go into great detail about why the Bible is NOT corrupt and why all churches are NOT corrupt. Both of these charges are stereotypical generalizations. This back-and-forth has been quite extensive and, I believe, has run its course. So this conversation is finished.